When the Mission Includes Excitement and Food… The Pug Is There! When trouble strikes or adventure calls, you can always rely on one charismatic figure to be right in the thick of it: Major (retired) Mac The Pug. His athletic prowess, towering intellect, undaunted courage, and discerning gourmet palate are renowned the world over; a diplomat, a conqueror of all he sees. Follow The Pug on his brilliant tour of attractions ranging from golf course greenery to an airborne assault on Yellowstone Park, from catching the perfect wave to catching the perfect nap. Whether exploring the Artic or defending his front yard, exposing financial malfeasance or battling scolding matriarchs, The Pug brings his own inimitable style. The world is his oyster…and speaking of which, you’ll also enjoy his distinguished glossary of food. 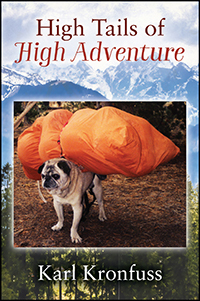 Snappy satire meets swashbuckling bravado in High Tails of High Adventures, a book that will leave you laughing and newly appreciative of the wondrous creature known as The Pug. The Pug, possessing considerable scholarship on the matter, speculated most republicans would evolve so as to have both eyeballs on one side of their oversized heads, similar to the Giant Flounders of the deep dark oceans. This evolution would be driven by their habit of turning their heads sideways so as to be better able to sink their teeth into the haunch of some poor unfortunate beast who has spent the better part of spring and summer, shoulder to the wheel , in the hope of putting a few extra nickels away to help tide himself through the upcoming cold and lean season. 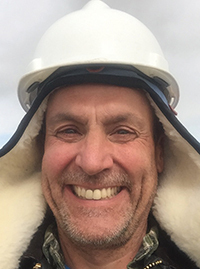 After a successful career as a custom furniture builder, Karl Kronfuss has taken a position in a mothballed uranium processing facility in an effort to kick start a new career as a writer. High Tails of High Adventure is his first book.